← Hot Off The Grill! 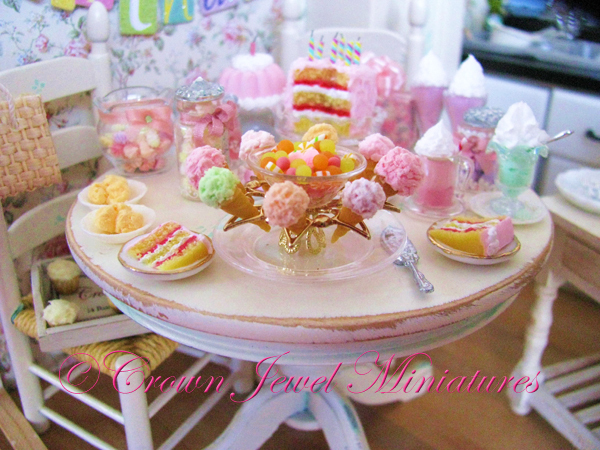 OOAK Ice Cream Holder & Candy Dish! 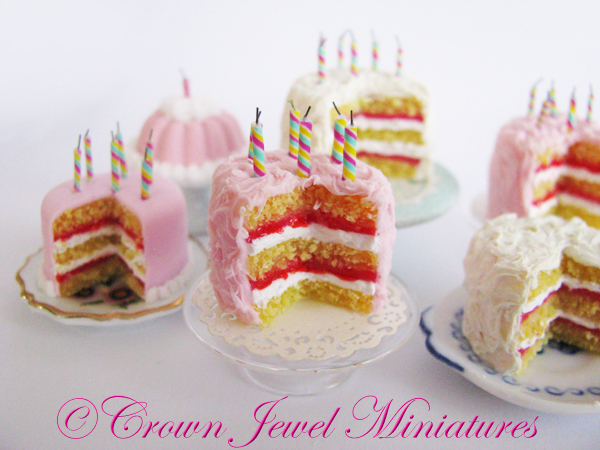 Those of you who read my recent “Birthday party” post know that I promised a one-of-a-kind original surprise and I unwrapped it today in my eBay (ID: Crown_Jewel_Miniatures). My highly realistic ice cream cones are one of my most requested items and last month I invented the perfect way to display them… in a festive rainbow of color and fun! 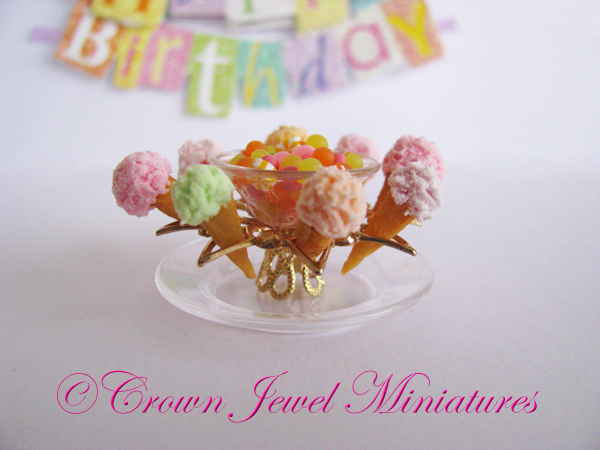 My OOAK exclusive ice cream cone holder and candy dish is perfect for a birthday, summer or sweet shoppe party! It is a OOAK exclusive, and my own original idea- you will not find it anywhere else! 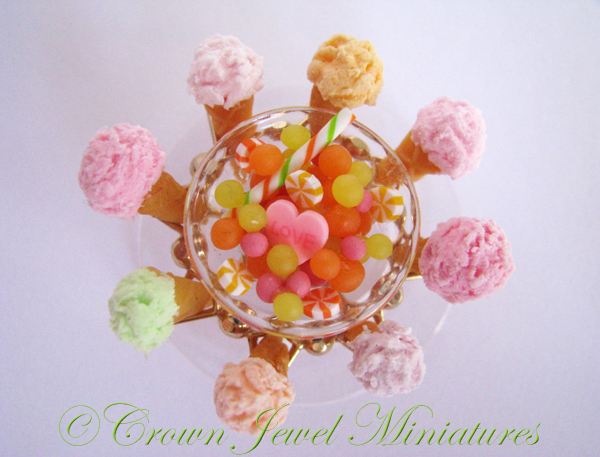 The fancy ring holds 8 ice cream cones over a clear “drip tray” but your mini people won’t waste time leaving them in the holder with refreshing flavors like lime, raspberry, strawberry, orange, berry cream and peach ice cream! The glass bowl in the center is filled with citrus and berry flavored bonbons, pinwheel, stick and hard candy making this party time treat truly irresistible! 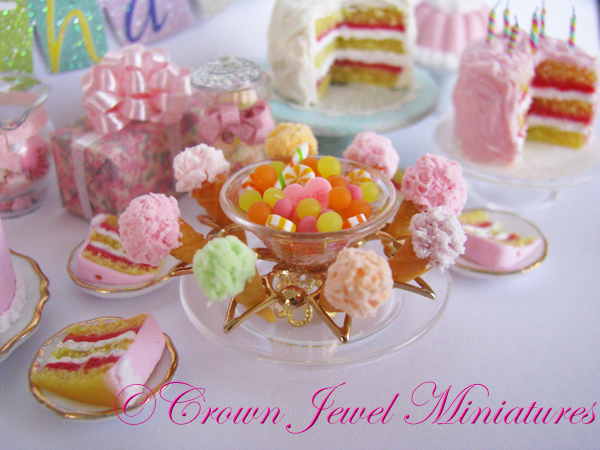 Many of the other party treats shown in the background of my photos are are available now in my eBay. 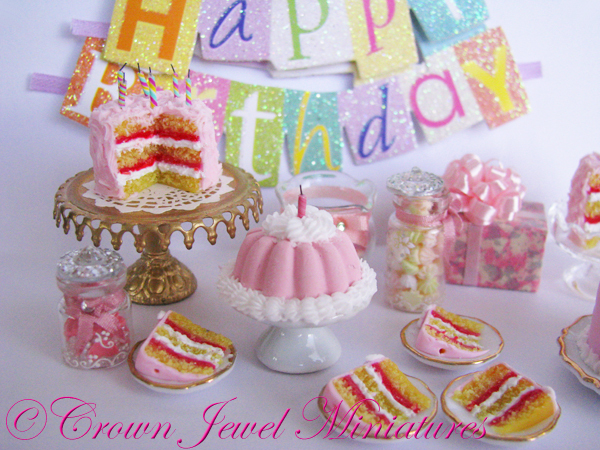 I’ve got pink birthday cakes, fondant birthday cakes, homemade cakes that look just like Mom’s and even a fluffy yellow and white cake on a handcrafted cake stand suitable for a boy or girl. 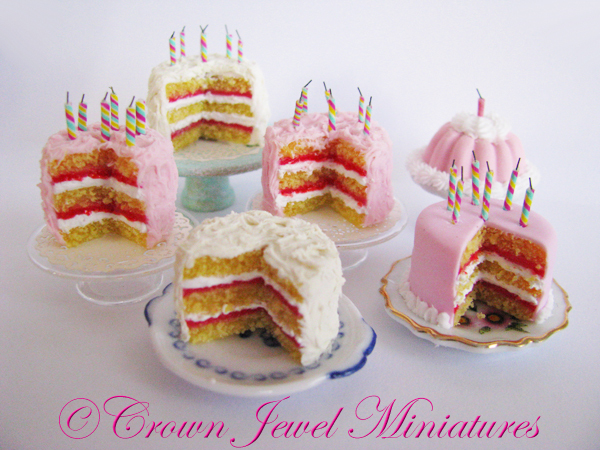 Almost all birthday cakes have the tiniest birthday candles in festive colors, complete with wicks for that extra dose of realism you’ve come to expect from my art. Parfait mugs, bowls of ice cream, pretty bowls and jars filled with pastel meringues… it’s all here. 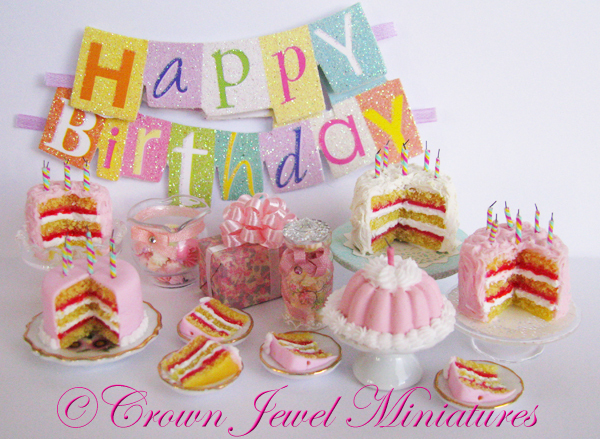 This entry was posted in Announcements and tagged 1" Scale Food and Miniatures, 1:12th scale food, Crown Jewel Miniatures, Dollhouse Food, Dollhouse Miniatures, IGMA Artisan, Mini birthday party, Polymer Clay Dollhouse Food, Robin Brady-Boxwell. Bookmark the permalink.